Yesterday I wrote about FedEx and Safe Kids working together to ensure that our kids are safe and protected while trick or treating on Halloween. Now for more information and a GIVEAWAY. For more tips on how to help kids become safer pedestrians on Halloween, as well as throughout the year, visit www.safekids.org and visit our Facebook page at www.facebook.com/safekidsusa. 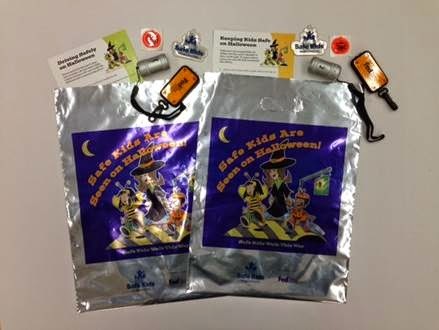 Thanks to Safe Kids & Fed Ex my readers have the opportunity to win Trick Or Treating bags like the photo above. Disclaimer: No monetary compensation was received to host this giveaway. I will be receiving my own bags. Carry glow sticks at night.